Looking for the best beard trimmer in town? Perfect. You’re in the right place. Beards are in style. Some might even say they always have been. Everyone has their preferred facial hair strategy and it typically hinges on how much patience and appreciation there is for growth and style maintenance. Regardless of where you are on the beard appreciation scale, if you’re growing out those wonderful whiskers, getting your hands on the facial hair trimmer for your unique grooming needs is an important part of the process. For most bearded beauties, it’s not the growing of the beard that is the most challenging but rather keeping it tamed and under control. Whether you’re into the full lumberjack, the Wolverine, or the George Clooney, having the right tool for the job can make all the difference. This is where this ultimate buyer’s guide to the best electric hair trimmers comes in. Forget the knicks and cuts and enjoy the admiration of a well-groomed beard. Beard envy is on the horizon. 9 To Foil or Not to Foil? Do you want to just cut to the chase? If so, let’s dive right into our top 3 picks for the best beard clippers in town. As far as beard trimmer reviews go, there are a lot of criteria to be considered when choosing the best groomer, like battery life, clipping length detail, and overall performance. When it comes to the best beard trimming kit available right now, our top picks will make sure you have the best trimmer you can get your hands on. 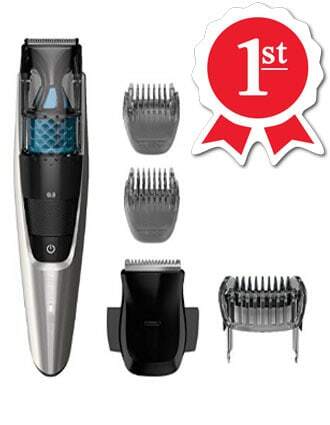 Here is a quick view of our top 3 picks for the best mens trimmer of the year. For more detail on each product, see below. Men have been looking for ways to stay well-groomed for as long as history can remember. When it comes to grooming facial hair, we have stopped at little in the pursuit of a clean and safe removal of our unwanted five-o’clock shadow. Before the advent of copper razors around 5000 years ago, some people used two sea shells to pull out the hair with the help of water and a sharp tool. Picture Tom hanks stranded on an island asking Wilson for some advice on his grooming standards. Thank goodness that’s no longer a thing! The straight razor was the beginning of a much more efficient and painless approach to grooming that was able to revolutionize the way men looked at shaving. This relatively new approach, beginning in the early 1800’s, was quick to catch on around the world spurring ideas for better ways to shave. With the first safety razors appearing for general consumption in the late 1800’s, by the early 1900’s we were well on track to experiencing the world of razors we have come to appreciate today. Shortly after the introduction of safety razors, electric shavers also began to saturate the marketplace. In 1928, the first electric shaver was invented by Jacob Schick and continued to evolve from there into the high-tech systems we have today. Have Wife, Daughter or Sister? Check out, 42 Short Hairstyles For Women! If you love a traditional wet shave, you can thank the Gillette Safety Razor Company for that. It was due to their invention of the double edged safety razor that the personal grooming industry took off like a Tesla on a test drive. In 1918 alone they sold 3.5 million razors and 32 million blades. This was such a successful initiative by Gillette that the U.S. military demanded their entire razor production division devote itself to providing hardware for the troops during WWII. This resulted in the production of over 2.5 million razors and over 1.5 billion blades being provided to the servicemen. How’s that for a clean shave! Not all beard trimmers are created equal. When choosing the best trimmer for men, the options can start piling up pretty quickly. So, with so many options for electric razors and hair trimmers in the marketplace to choose from, how do you find the right one for the job? Well, like anything worth your while, it just takes a bit of comparison, research, and quality control to come up with a short list of great options. There are a few basic criteria that, if followed, can ensure you come out with a high-quality manscaping kit. Time to turn up the beard envy. This may seem obvious, but it must not be overlooked. Why buy a trimmer that turns into a glorified paperweight after only a few uses? When looking into a high-quality build keep a couple things in mind: material quality and grip comfort. If the materials are stainless steel or titanium then you are off to a great start as these will last for many years to come without requiring replacement. Try to avoid systems that are primarily plastic. These are often much less reliable and feel cheap in the hand. Taking heed of your shaver’s build quality makes sure that it will continually stand up to the test of mowing through that mound of madness when it needs it the most. When it comes to your new beard and moustache trimmer, you may have some extra features you can use for your unique needs. With so many amazing features in the newer models, you can get a very versatile shaving system that can handle even your most challenging requirements. Many models now include options such as nose/ear hair trimmers, turbo-trimming mode (for those extra challenging mattes), vacuum systems, body groomer options, and self-sharpening. These are not required, of course, but can help take your grooming standards to the next level. Unless your ready to go back to the seashell method mentioned above (Wilsooooon! ), length settings can make or break the deal. If you are not going to get the detail you are looking for from your trimmer you’ll likely stop using it altogether – clearly not the goal. Many trimmers have one of two ways to ensure you get the clipping length your looking for. The first way is through a series of attachments. By quickly snapping on a length guide to the clipper head you can get the precision you need. The other is a built-in system that adjusts on the trimmer itself. These are typically a bit bulkier to accommodate for the adjustment mechanisms but are very convenient for people who want an all-in-one system. Either way, make sure to choose the model that has the length settings that will suit your needs. At the end of the day, it really doesn’t matter which of these you choose. It’s all about what your lifestyle preference are. One thing to keep in mind is that plug-in models tend to have a bit more power behind them than their battery operated cousins. If your beard grooming routine is in a well organized bathroom with easy access to power outlets, you may fare quite well with a corded electric beard trimmer. If you’re not bothered about navigating cords and appreciate the additional power, this could easily be your preferred solution. If the raw horsepower and the use-anytime-no-hassle features of a corded model doesn’t matter to you, the portability and convenience of a cordless trimmer will certainly make your day easier. Just make sure to keep it charged and be patient in the harder to clip areas and you’ll be well on your way to a perfect presentation. This is one of those options that you need to be careful to attend to if you want to make sure you get the most of your trimmer. The closer your clipping needs are, the more you have to pay attention to how your skin reacts to your trimmer. If you like to shave in the shower, or like to have a wet face during grooming, then you’re going to want to opt into a model that can handle the moisture. Not all models have a waterproof feature and can be damaged with exposure to water. If you’re already used to the experience of a dry shave then you have no limitations on the model you can choose from. After all, even though a particular trimmer may be waterproof, all models can be used dry. This is another preference that is completely dependant upon your unique needs and facial sensitivity. The good news is, you have the option. With prices ranging from $9 – $300+ for various trimmers on the market, your budget is going to come into consideration. Our top picks are all priced under $70 so you should be able to get a high-quality beard trimmer for under $100 depending on where you are shopping. Like all things, price can sometimes indicate the quality of the product, but not always. There are some very high quality trimmers for reasonable prices if you are willing to do a bit of digging. And this is exactly what you are doing by reading this! We have been able to compare and contrast all the best beard trimmers around so you don’t have to. When looking into buying a new beard trimmer, make sure to keep a few things in mind. Let’s go over a few things to ask yourself before making your purchase. Where are you typically located when grooming? Are you a shower groomer? Do you have a big luxurious bathroom or a tight little cubicle that’s hard to clean? Do you travel a lot and require something you can pull out in an airport or taxi on the way to a meeting? These are the kinds of lifestyle questions you need to consider when choosing the best trimmer for men. How detailed is your grooming routine? Are you in need to something that can carve tight lines and get a skin-close shave? Does your beard just need a quick clip to keep it under control? How often do you need to use your razor? How long does your routine take from beginning to end? Depending on your unique face-sculpting needs the trimmer you choose will need to reflect your lifestyle. Light duty or heavy duty? Do you have a mound of massive hair that nearly requires a lawnmower to chew through the luxurious fur? Does your facial hair come in patchy and thin? Do you just trim a small area for detail and leave the rest go wild? Are you very particular about various lengths and fades? Every great electric trimmer can handle most duties, however, you’ll want to consider something that can cater to your specific hair-type and grooming preferences. With so many electric shavers for men on the market, we felt the need to narrow down the playing field a bit to bring you The Best Beard Trimmer Ultimate Buyer’s Guide. Feel free to do your own research as well. This is the most comprehensive breakdown we could come up with across all the various models to choose from. This list is a quick reference for each model based on a few key criteria: Brand, Model, Type, Wet or Dry, Battery Life, Clipping Detail, Warranty Period, and Price. These are in no particular order, our top picks will be detailed in the next section. Here you go! As you can see from the above group of the best men’s beard trimmers, choosing the right one for you is not as cut and dry as you may think (pun intended). We have a lot to think about when choosing the correct model for our needs, and this is not something to take lightly. Remember, you will be using this tool for a long time ahead and you want to make an educated decision. 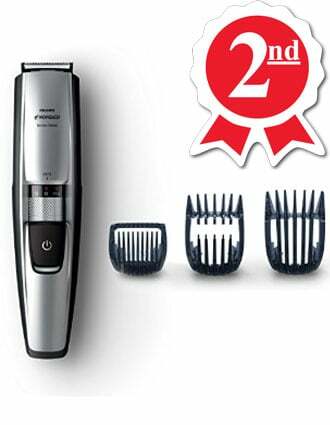 The best trimmer of the year is chosen based on user reviews, design quality, price, warranty, value (accessories included), and overall performance. All of these factors being equal, the choice is then made based on feel – how does it feel, sound, look, smell (yes, smell. You’d be surprised at how an overheated trimmer can offend your nose), and storage/docking. If you’re looking for the good stuff, this beard trimming guide will be your ultimate resource this year. So without further ado, here is our product roundup for your Best Beard Trimmer Ultimate Buyer’s Guide 2019. This little powerhouse by Wahl has made it to the top of the list. There are so many things about this trimmer we can mention, however, suffice it to say it makes for good beards. For this category, this is the best Wahl beard trimmer hands down, especially when it comes to overall performance, battery life, portability, and durability. If you’re looking for the best mens beard trimmer on the market today, this little gem may just be what you’ve been waiting for. That said, this particular trimmer is not for those of you who need to have a wet shave. This is not a waterproof system. However, even so, you are getting so much value from this trimmer it may be worth the transition. The Wahl stainless steel groomer kit is really great as well. It comes with a large assortment of accessories that serves nearly every bearded need. One of the first things you’ll notice when you unpack this trimmer is the high-quality feel. 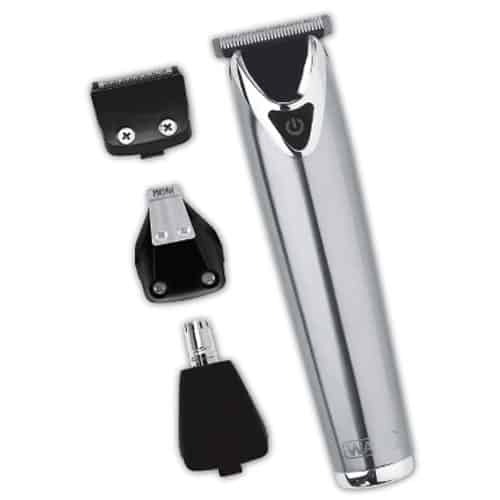 The full stainless steel body gives this Wahl trimmer a luxury touch that is not characteristic of low-end products. In fact, the only part of this trimmer that is not metal is the small rubber power button near the top of the unit. This makes for an extremely durable and very reliable trimmer you can use time after time in full confidence of its performance. A clever addition to this clipper is the small red travel plug that prevents the unit from accidentally turning on in your bag, thus avoiding turning your favorite shirt into confetti. It’s a simple additional detail that actually goes a long way. Just make sure not to misplace this small travel plug – it is small and easy to misplace. The t-blade trimming head is your ace-in-the-hole. It’s the perfect head for nearly all your trimming needs and helps to get the best styling accuracy you’re looking for. It’s all metal design boasts a comb that is ground, not stamped. Stamping is when the blades are ‘cut’ like a cookie cutter from a piece of metal and does not get the kind of detail that comes from grinding. Grinding takes a bit more time to make, but the end result is a far higher comb/blade quality. This makes a very big difference when it comes to staying sharp, feeding hair well, and overall performance of the comb/blade. The plastic comb attachments are touch and durable. Although the plastic clip (required for the piece to properly attach to the clipper-head) does not inspire much faith for long-term wear and tear, they do what they are designed to do quite well. As far as a Wahl cordless trimmer is concerned, these are a great fit for pretty much all of your manscaping needs. It does well on all areas of the body and can be used over and again in full confidence of its abilities. The only thing to be a bit cautious of is when you are clipping your head hair. This is a cordless unit and head hair requires a lot of juice to get through smoothly. Take it a bit slower to ensure a comfortable operation when tackling your hair cutting tasks. With this kind of power, portability, build quality, and versatility, there is really nothing in the way of preventing a 5-star review for the Wahl Lithium Ion Stainless Steel Groomer. 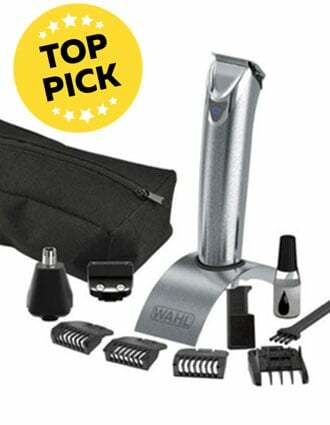 It’s the best Wahl trimmer in this category by far. This is the stuff dreams are made of. All in all, this is one of the best beard trimmers on the market. 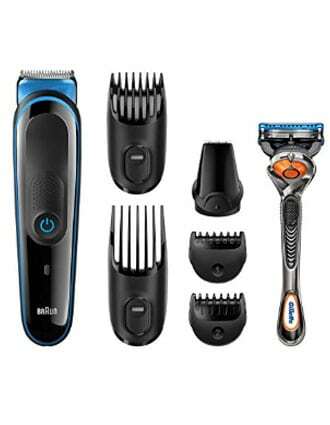 This Philips trimmer has many of the features you are expecting from a great beard trimmer and no shortage of features. The vacuum alone can help to make your grooming session easier to clean up and shave a few minutes off your time spent tidying up. One of the great things about the Philips Norelco 7200 is that it comes with a 45-day satisfaction guarantee. Give yourself some time to try it out in your everyday life. If you really love your experience, keep it. If not, you have a hassle-free return policy backed directly by Philips. This is something to consider just in case this trimmer isn’t the right fit for your needs. All of the buttons and features of this trimmer are easy to access and straightforward to operate. There is little to confuse with this sleek design and easy to operate basic features. With a large selection of stops on the built in blade guide, you will have no shortage of options for your unique beard needs. You can safely operate in the rage of 0.5mm to 10mm taking on nearly any facial hair you need to. The feel of this Norelco beard trimmer is sleek and satisfying in the hand. It feels like a high-quality finish even though it is not a full-metal design. There is a bit more plastic on this unit than some of the others, but it is functional and used sparingly. The vacuum unit does what it is supposed to do. However, if you are looking for a completely clean-up-free experience, this will not meet your expectations. There will still be pieces of hair to tidy up after your grooming session, albeit much less. The blades on this unit are stamped, not ground,, leaving your long-term detailing needs found wanting. Even so, the blades are tough. They will claw through whatever you have to throw at them with relative ease. If you are an international jet-setter than you’ll love the power adapter. Handling both 120 and 220 voltage, you’ll get great detailing regardless of your destination. You don’t have to worry about bulky voltage converters or causing an accidental meltdown of your unit while away. When choosing which models rise to the top of the list, landing on a solid top 3 choices is not easy. 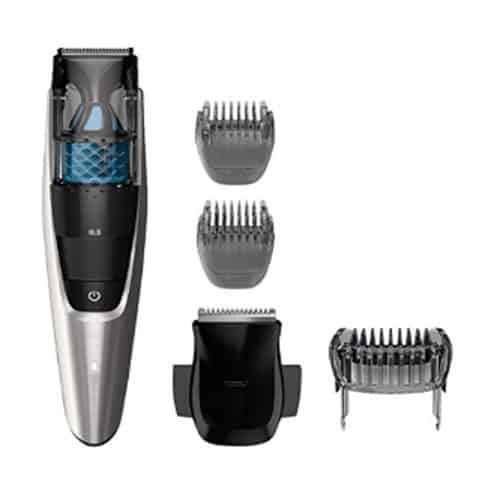 The reason the Philips Norelco beard trimmer 7200 Series makes the cut is because they do a very good job of covering all the most important features in one well-made and affordable shaving system. As the little brother of the runner-up 7200 series above, this powerhouse trimmer has a lot to measure up to. Even so, this is a trimmer worth every dollar. If you’re a price conscious groomer in need of a great tool for the job, you’ll find the Norelco Beard & Head Trimmer Series 5100 a great choice. Built in guide does a great job of getting the job done with its 17 built in length settings. International voltage built in to the power adapter. The guide can push hairs aside. You may need multiple passes. Out of the box you get a feel for its quality right away. It comes with body, face, and head combs that all do a fine job of getting the job done. As soon as you try it out, the Dynamic Beard Guide System is sure to please as it gracefully feeds your stubble into the blade for an easy and smooth operation. What sets this particular Philips beard trimmer apart from others in its category is what Philips refers to as Dual Sided Technology. This is an additional shaving head that provides a much more refined and detailed experience for those trickier spots requiring some finesse. You’ll appreciate this feature if you need a bit more of a refined cut. When it comes to a great mens beard trimmer, this is a great choice for you if you are looking for a wet shave. With the Norelco 5100’s fully waterproof design you can shave while in the shower, get sloppy at the sink, or make sure you’re looking great for that headshot while on location in the rainforest during a rainstorm. However you need to tackle your little ticklers, this Philips Norelco trimmer will have you well-groomed in no time. In short, If you are looking for a great all around unit that pretty much does everything you need it to (and more), you’ll certainly appreciate the Norelco 5100 all-in-one trimmer. One of the most well-known, yet under advertized, trimmers in the industry is the Andis T-Outliner. Known by clipper aficionados as one of the best detail trimmers on the market, you’ll be getting all the bang for your buck you expect to. With the recent introduction of this cordless model, Andis has brought itself into a whole new space and can now compete for your attention in the best cordless trimmer category. Not waterproof. Dry detailing only. This is the trimmer for you if your needs are heavy. With a 7200 spm output, you could cut through your neighbors hedges in one fell swoop, nevermind your voluptuous (and venerable) stubble farm. There is no stopping this little unit once you put it to the test. It will do its job and then some, in perfect comfort, quiet, and ease. With the Constant Speed Technology, even your most challenging grizzle will pass through these teeth in fine form. Forget about the days of tugging and snagging, this little gem will be sure to please. With a trim getting as close as 1/32” (0.8mm) with just the trimmer head, and up to 3/8” (9.5mm) with the large comb attachment, you should be able to tackle whatever you need to (also keep in mind that this unit has a ‘zero-gap’ adjustment option making for an even closer trim than written above). For some, only having 5 lengths to choose from is limiting. If you are on the lookout for a lot of leeway insofar as cutting length options is concerned, this may not serve your needs. Even so, this is probably the best cordless trimmer available in the up-and-coming category, limits aside. This is a powerhouse. 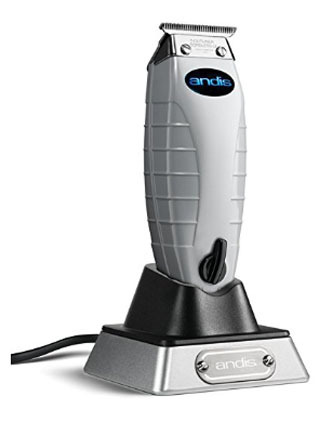 If you want one of the best trimmers out there, period, then you’ll certainly appreciate the Andis Cordless T-Outliner® Trimmer. It’s a professional beard trimmer, body trimmer, and hair trimmer so you’ll never have to worry about it conching out on you when you need it most. Remember, if the pro’s trust this in the barber-shop, you can trust this in your man cave’s groom-room. If wet shaving, clip lengths, and price don’t matter to you, these are the best hair clippers for men and women alike – anywhere hair grows on the body (ears and nose excluded). If you are looking for a powerhouse, this is not the solution for you. There are plenty of models in this guide that will serve your needs better if you are looking for a mini-lawnmower for your face. This is a great solution for you if you have light to medium duties to perform a few times per week. Let’s face it, if you keep all the important things tidy and looking great who cares what you paid for your trimmer, right? Realistically speaking, this is a great all around budget-conscious solution for pretty much all your grooming needs. The Norelco Multigroom MG3750 packs all the accessories and nominal power you’ll need to get the job done and save money doing it. 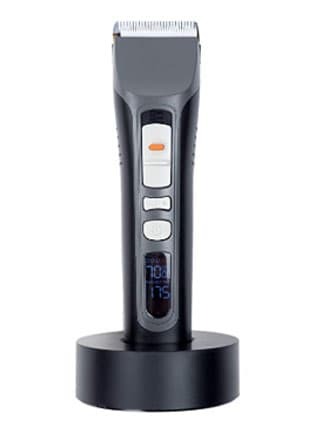 This is perhaps the most highly sought after Panasonic beard trimmer on the market in its class. It looks great, performs like a charm, and keeps on going even if you’re all tired out and ready for a nap. Keep in mind that although this trimmer has all the charisma and styling of a Italian designer, it’s what’s inside that counts right? Exactly. A bit to lightweight overall, and top-heavy. The thing about so many trimmers on the market is that they can get caught up in beard hair as the comb passes through for a clean cut. This can cause snagging and tugging that can cause irritation, a real pain-in-the-face for the sensitive skinned among us. Somehow, this particular blend of power and form that Panasonic has developed for this trimmer prevents this annoying snag nearly altogether (perhaps other than on the most rugged of lumberjacks). The one thing that is pretty annoying is that the battery takes 15-hours for a single charge that lasts for only 50-minutes or so. This seems a bit unreasonable given that so many other models sport a stellar battery life and charge time. If you are looking for a great trimmer for your sensitive beard, look no further. Although the Panasonic ER-GB40-S Milano has a few downfalls, it may be one of the best beard trimmers for long beards around, and can handle pretty much all the stubble you’ll ever throw at it. This unconventional trimmer/shaver is one of the most interesting of the bunch. 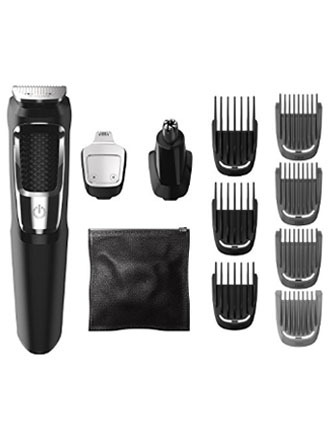 It makes us completely rethink the way a trimmer and shaver looks, functions, and feels. Obviously the most important thing to consider in a new trimmer design is the ability to do the job: groom. But just how well does this new design stand up to the test? You might be surprised! For a model that is breaking conventions, this is actually a really great trimmer. It’s going to do a lot of things well: trim, edge, shave, and contour. Be careful if you are doing any trimming ‘south of the border’ with this one though. If you get the wrong angle to get at tough spots or press a bit too hard you’re gonna draw some blood. This handy tool feels a bit more like a traditional wet-shave Gillette razor. It contours and hugs the face quite well. It can handle every angle of the face and then some making for a comfortable shave. Because the unit boasts a two-way blade, you can shave up and down without painful snagging as the head oscillates back and forth 200 times a second. If you’re a wet shaver, this is going to please. The blade is so easy to access and clean while using it, you’ll forget it’s an electric razor. The sturdy grip and form fitting design makes the OneBlade Pro feel sturdy even with a bunch of shaving gel dripping into your hands. If you’re looking for a great multi-function trimmer/shaver, this is the one for you. It boasts a great battery, great shaving abilities, precision trimming, and wet/dry capabilities for all your grooming needs. If you opt into buying the Philips Norelco OneBlade Pro just keep in mind the cost of replacement blades every four months. If you don’t replace them, the odds of getting snagged or cut only increases with time. There is a certain sort of man who requires that extra little bit of precision detailing, kind of like a high-end car. When you have that extra shine on the grill, everything just pops a bit better. Well, if you treat your grooming the same way as you would a customized Nissan GT-R50, then the Remington PG6171 – aka The Crafter – is waiting at the pit-stop for you. Everything about this Remington beard trimmer is so much more than what meets the eye. First, it’s not just a beard trimmer. The Crafter is a whole-body grooming master, ready to take on all your manscaping needs. The ergonomic handle and design on this Remington trimmer make every angle fully accessible, every hair easily hackable, and every man excessively kissable. 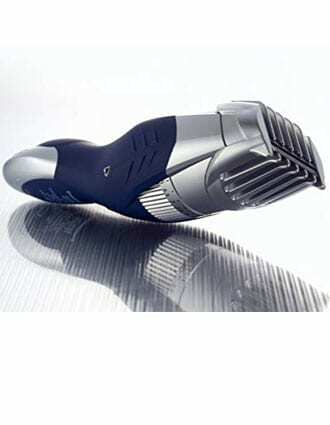 If you are looking for a long beard trimmer, this will also get you sorted. With the sturdy combs locked in place, guiding your fuzzies through the clipperhead is a breeze. The comfortable grip allows for a great one-handed operation while your other hand uses a styling comb to make sure you sculpt the perfect length every time. Touting The Crafter as your long beard trimmer, your good ol’ Duck Dynasty will be ready to take on the world like a buck in rutting season. You can’t go wrong with so many attachments, either. You’ll have access to head-to-toe grooming with all the fine detail potential you’ll ever need. With up to three hours (!) of run time on a single charge, you’ll be ready for the cover of Esquire after every grooming session. This is an excellent trimmer. You’re gonna get extraordinary detail from this inexpensive Remington. Get ready for the most detailed trim of your life. Keep in mind that you may want to use a wet razor for some of your final touch-ups as the foil shaver may not be able to live up to your standards. But for what you get with this trimmer kit, you’ll be happy with the end results regardless. If you’re a traditionalist and want to power and performance of a professional beard trimmer, look no further than this powerful classic. No hair is safe from this guy. With enough power to shave a sheep’s hindquarters, if you want to get the job done like the pros, the Andis GTX T-Outliner® Trimmer will take on any task with grace and ease. This unassuming trimmer by Andis is likely going to surprise you with its ability to take on whatever you throw at it. Heralded by pros as one of the best detail trimmers for the price, you’ll be strutting proudly with the results in no time. The sturdy build and outstanding performance (7200 spm) will ensure a consistent outcome every time you trim. With the standard professional trim lengths included with the four combs (size #0 (1.5mm), #1 (3mm), #2 (6mm), #3 (10mm)) there is little you won’t be able to handle. If an even closer trim is needed, this model has the ability to be ‘zero-gapped.’ This means that the blade and the comb can align in such a way as to provide a nearly skin-close trim that will please even the most picky of fade-lovers. If you can get over the bland design and color, this classic cutter will serve you and your trimming needs for years to come. Unlike its little brother (the non-GTX version), you will never have to worry about this unit heating up to much. This is because of the magnetic (rather than electromagnetic) motor driving this powerful trimmer. If you’re looking to buy an uncomplicated classic trimmer that will handle anything you throw at it, look no further. 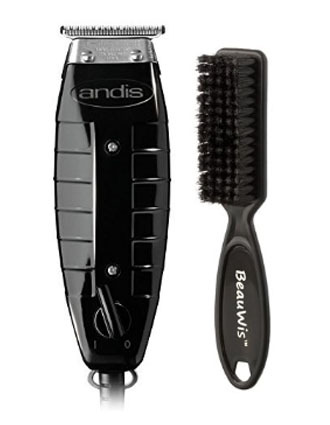 For the price, the Andis GTX T-Outliner® Trimmer will aim to please, all day, everyday. Keep in mind that like most professional systems, this takes some care and attention to maintain. Oil the blade regularly, keep the unit dry and whisker-free, and keep the cord untangled and knot-free. If you’re not into feeling like you have to be a Yoga master to get to all the areas of the body while travelling, you’ll really like the Braun MGK3045 Trimmer Multi-Grooming Kit. This was a hard one to land on because there are other trimmers with sleeker designs, less attachments, and slightly more travel-friendly body-sizes (like the Trym II travel trimmer). However, it’s nice to have a bit of power and reliability too. That’s the reason for this particular braun beard trimmer making the list. The last thing any man wants is to be looking shabby for a first impression. If you’re a jetsetter on a mission to change the world, keeping your beard in check is the last thing you want to worry about. With the Braun MGK3045 Trimmer Multi-Grooming Kit in tote, you can be fully confident that your grooming standards will be well met. The feel of the unit in the hand is great. You can tell that it’s meant for someone who wants to get the job done with as little hassles as possible. The 60-minute runtime will surely tackle whatever you need while on the road. Just make sure to keep it on the charger in your hotel room overnight to ensure full use. It takes about 8-hours to come to full charge and you won’t want to get halfway through a trim and have the unit run out of juice. And, with the international charging adapter, you can be confident in plugging it in wherever you need to. 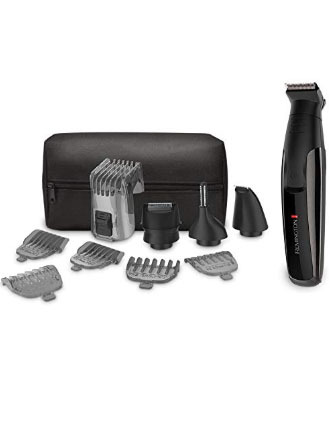 If you need a great travel companion take care of all your grooming needs (south of getting your own travelling barber) then getting your hands on the Braun MGK3045 Trimmer Multi-Grooming Kit will surely do the trick. Get a nice carrying case for this and you’re well on track to having a great stubble trimmer wherever you find yourself in the world. When it comes to trimmers, the constant buzz that comes from the motor and blades can be irritating to some. It’s not all that ASMR if you really think about it. If you find it annoying to put up with the hum while you trim, look no further than the Brio Beardscape. Not only will this trimmer tackle your grooming needs like a boss, it’s the quite possibly the quietest clippers on the market today. Gosh, this trimmer is awesome. The Brio Beardscape Beard and Hair Trimmer is hands down one of the best beard trimmers on the market right now. It could easily compete for the best trimmer of 2019 but we need a competitor for the most quiet trimmer category. It’s really hard to find anything upsetting about this trimmer. The Apple-esque design is very pleasing to the hand AND the eye. It’s easy to navigate anywhere you need to go. And with up to four hours of runtime, you’ll never need to worry about running out of juice mid-groom. The reason this trimmer is so quiet has a lot to do with the ceramic blade and titanium comb combo. Ceramic is far less noisy than it’s metal cousin. It’s also conducts a lot less heat so it’s more comfortable on the skin. Ceramic blades are also 4-times harder than steel so it’ll stay sharp through your toughest jobs trim after trim. The unit does not come with many length options, however. So if you’re a finicky fade fanatic (and there’s nothing wrong with that!) then this may not suit your needs. Even so, some of the other features are awesome. It even has a notification system that tells you when it needs to be cleaned and oiled (about once every hour or so with heavy use). Cleaning is easy with a quick brush and oiling takes only a second to lightly drizzle the blade for optimal performance. This is one of the best trimmers in the market. If you’re not fussy about fancy attachments and multiple length options, the Brio Beardscape Beard and Hair Trimmer will be the best gift you’ve given your face all year. Put it on your wishlist, you’ll be glad you did. If you haven’t noticed, the Philips Norelco lineup of trimmers made the cut across a few different categories. It’s a great product line, and many might say it’s the best hair trimmer around. 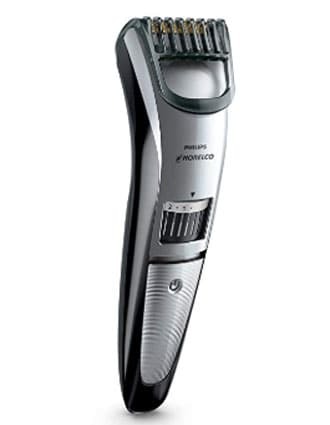 In honor of that opinion, the Philips Norelco Beard trimmer Series 3500 ought to have a place on the podium. We didn’t really know where to put it, so we made a new category for great overall trimmer that just made the cut. With 20 length settings, an hour of usage time, and an easy to hold grip, you should be well pleased with the overall experience with this trimmer. It’s not so great for longer beards if you are looking for reliable length detail. The higher settings on the trimmer do not always achieve a consistent cut-length for some reason. Are you looking for a simple trimmer for short beard maintenance? If so, then you should get everything you need out of this model. It’s not meant for tackling all your manscaping needs but can do the job of getting those cheeks in check. 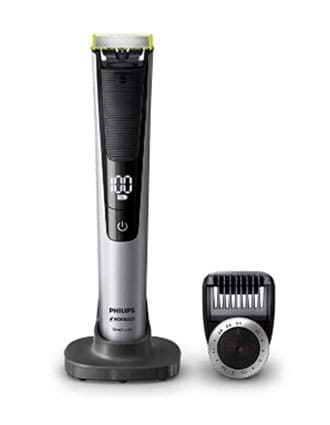 Overall, if you are a short-beard lover with only basic needs to care for then you can get everything you need from the Philips Norelco Beard trimmer Series 3500. Don’t opt for this of you are looking for extra detail, want a great long-beard, or need body grooming work done. Even so, you can’t go wrong with this one for basic trimming needs. Now that you have seen the best picks for 2019, make sure to cover all your bases before making your final buying decision. Are you hard as stone or sensitive to the touch? Is your skin flaky or smooth? Lay flat or stand straight? One direction or many directions? Matt prone or easy to comb? Are there long-term maintenance costs? Does it come with the accessories you need or are they extra? Do you have to buy extra products like cleaning agents or extra parts? Do you require an adapter for travel or a carrying case? Are you sensitive to loud sound? Are you keeping things to the face or do you need to go south of the border? Making sure to refine your needs based on at least these basic criteria can make sure you are well on the road to a great relationship with your trimmer (not to mention your other half). Not all trimmers are created equal and you want to make sure you get the most out of your investment based on your unique grooming needs. At the end of the day this is totally up to you. There are pros and cons to both that should be addressed before buying. Let’s just have a quick look at some of the things to consider. This is the original G. It was the foil razor that men were introduced to back in the early 1900’s and it’s been humming along ever since. Foil razors use the oscillating action of the blades moving back and forth under the ‘foil’ that covering. The foil covering acts as a protection from being maimed by the blades but also as the ‘scissor’ that helps the blade to cut the hair. The rotary system was invented and deployed by Philips in the 1930’s. They now lead the market insofar as rotary systems are concerned. Rotary shavers require a bit of a different operational finesse as they need to be used in a clockwise motion. If you try to use this like a foil razor you’ll end up snagging yourself. It’s better for contoured areas as the blades can form to the curves of the face a bit easier than the blocky foil razors can. In short, there is no particular ‘best’ choice here. It really is dependant upon your personal needs. Many of the multifunction systems in this guide come with foil attachments as they are easier to deploy. However, if you want a dedicated shaver that can do the job, a rotary shaver may be the one you opt for. When it comes to anything sharp, you should always have a plan of action around how to safely use your beard trimmer. It’s not rocket science or anything, but a few quick precautions can go a long way to a pleasurable grooming experience free of knicks, cuts, and the random severed head. It might seem like an easy oversight, but getting your face (or particular bodily destination) ready to trim is important. If you are using a wet/dry system you can basically go to town with just a bit of combing. However, if you are using a traditional dry trimmer, make sure the hair is dry, stiff, and straight as can be. Also be sure to get rid of any excess oil in the hair to avoid gumming up the razor. A quick rinse with a bit of your favorite soap should do just fine. If you want to get fancy, you can opt for a special pre-trim solution. These are typically alcohol-based and laced with some vitamins and minerals to give you a more pleasant shaving experience. Trimmers are like anything with an engine: they tend to run the best when they are given a little TLC. Maintaining your trimmer is pretty easy to do, unlike your Lambo in the garage. Oil the blade slightly before and after each use (on most models), keep the blade whisker-free, watch out for rust and replace when necessary, and replace blades when required. This will ensure you get a great shave and you’ll get more time out of your unit. You want to make sure you make good contact with the skin. Hold the trimmer at right angles to the clipping area. This makes for smooth operation and less snagging. Also, use your free hand to pull the skin tight so you get clear sailing through the scruffier spots. Electric razors can get hot. This is due to the friction created between the blade and the comb (or blade and foil). Also, depending on the model, the motor can cause heat as well over extended periods of use. Try to finish your sensitive areas first, like the neck, and then carry on to other areas. Take it slow. The more patient you are the better your shave will be. You may have to go over an area a couple of times to get the job done. Just keep at it and you’ll be smooth as silk in no time. It really doesn’t take much to keep your trimmer happy. Often just a bit of oil, some light brushing, and maybe a rinse (depending on the model) is really all you need. If you are using a foil shaver, make sure to replace the blade as per the manufacturer’s suggestions. Watch for rust, broken blades, or any other wear and tear. If you make sure to keep these basic care instructions in mind, you’ll have a humming unit for years to come. Consult the manufacturer’s instructions for any unique care tips for your model of choice. What is the difference between an electric trimmer and electric razor? An electric trimmer is typically designed to take your stubble down to a consistent length predefined by the comb setting used. These are typically best for taking a long beard down a bit, or prepping the face for a clean shave after a period of growth. An electric razor is typically designed to act as your manual razor would: to get a clean shave. You’ll find that your choices are between a foil or rotary design that gets your shave as close to a straight razor as you can get, without the straight razor. How much does a quality beard trimmer cost? A decent beard trimmer should run you somewhere between $50-$250 depending on what you are looking for. There are models under $50 and more than $250, but generally speaking you can find a great model in the above expected range. Using this guide can help narrow down your decision. Can I use a beard trimmer on other areas of my body? With most models, yes. Sometimes the model you choose may not be as suited to manscaping as others are. Make sure to be clear on what you need your trimmer to do so you can land on the right model. How do I adjust the trimming length? 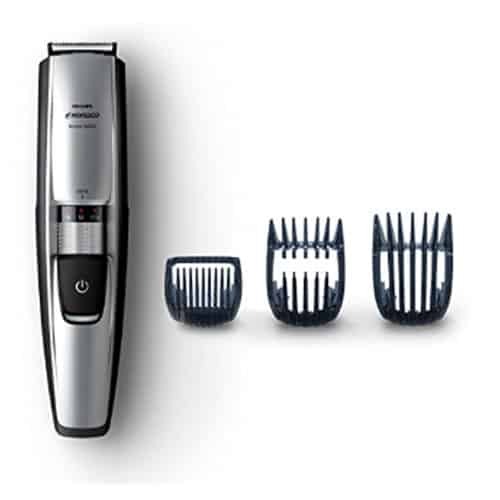 If your trimmer comes with multiple attachments and accessories it’s likely that you can adjust the trimming length by attaching the appropriate comb for the task. If it’s your first time with a comb size, make sure to test it on an area you’re not worried about looking great if you make a mistake in choosing the size. Where can I buy a quality beard trimmer? We have clickable links to all the products in this guide right in each description. If these don’t suit your needs, that’s cool too, at least you have a head-start! Realistically, a quick search online should yield a decent array of results for you. If you’re more of the brick and mortar style shopper, go to your local beauty supply store and ask them where you can get a great set of clippers. Finding the best hair trimmer of the year was a long and arduous process. However, it paid off in spades. With this Ultimate Beard Trimmer Guide you’ll be much more informed and able to make an educated decision before making one of your most important purchases: a quality beard and body trimmer. Whether you opt for one of the more robust and accessory rich multifunctional systems or an all-in-one professional unit, as long as you follow the tips in this guide before making your decision you’ll make a great choice regardless. Remember, many of the manufacturers offer a no-risk return policy guarantee so you are not stuck with a trimmer you thought would be great but ended up being a flop for your needs. Trust your instincts. If you get a good impression with one of these models, try it out. Every model on our list is a great trimmer, even the budget models. Give yourself a chance to try one out for a bit. You’re well on your way to being the envy of the bearded community. You’re just one stroke away! Happy grooming fellow manscaper. Enjoy the best beard trimmer in town!